At CorkSport we are glad to be a source for help with those that have questions about their Mazda. I personally enjoy helping with drivability problems or Check Engine Lights! P2187 is a good example of a common code in the Mazda world. Especially those with Mazdaspeeds. 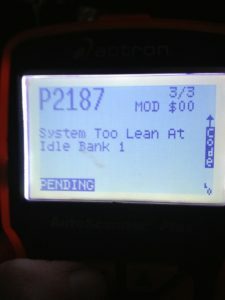 “System too lean at idle.” Now you may be asking, what does this mean, and how is it fixed? There are other lean codes all of this could apply to; this is a typical example. It’s quite easy to figure out yourself, and I’ll be walking you through the simple procedure to track down the cause! 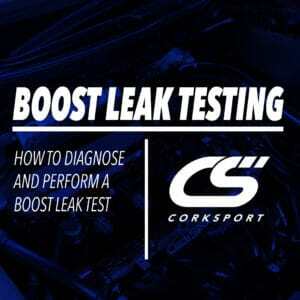 Using my Mazdaspeed 3, we will go through some of the diagnostic steps of Boost Leak testing, and touch on some other common causes of a lean at idle code. AFR – Measured by your primary 02, your air-fuel ratio is vital to watch and monitor if you are modding or trying to make more power. Your Mazdaspeed is tuned to hit certain AFR targets, and relies on the 02 sensor and the MAF Sensor (Mass Air Flow) to adjust fuel delivery accordingly. However, there are things that can interfere with how these sensors communicate with the ECU, and if this happens, it will throw your system out of whack. Examples are vacuum leaks, boost leaks, leaking nozzles/injectors, exhaust leaks, etc. Fuel Trims – The measurement of how much your ECU needs to adjust fuel delivery. There are two kinds of fuel trims. Short Term Fuel Trim (STFT) – Cars immediate Reaction To AFR Fluctuations, and responsible for keeping LTFT in check. This is constantly switching around. At Idle you should see close to 0 once it settles. Meaning that the RPMs are not fluctuating, and its steady. Long Term Fuel Trim (LTFT) – Cars long-term reaction, which will change over time-based off how the short terms are doing. When you get a custom tune, your tuner will do what’s called a MAF calibration, to get this number as close to +/- 0 as possible. The less your ECU has to correct its fuel delivery the better. Anything (-) means it’s taking away fuel, so the AFR’s its seeing are slightly richer than what it thought they would be. Anything (+) means its adding fuel, so the AFR’s are slightly leaner than it should be. If you are seeing high or pegged STFT, the ECU is trying it’s very best to correct AFR to target. Now that you have the basic understanding of what these mean, it will be easier to read the Accessport and see just what is going on. You will be able to watch how the computer is compensating for whatever the problem is, and be able to make a more educated decision on how to track it down. Assuming the issue isn’t caused by something on the exhaust side, the most popular method would be the boost leak test. Creative name, right? You can make one of these testers yourself, and it only costs a few bucks. All it consists of is a properly sized (And closed off) PVC section that you clamp onto your intake using a silicone coupler. It looks a little something like this. Notice that there is a Schrader valve on top (Tire valve) This allows you to pressurize the system with air. You can use a bike pump or an air compressor. Obviously, the air compressor will be a bit easier as you can fill it up much faster. Pinch off the line running from your intake to your valve cover or oil catch can, you don’t want to be forcing air directly into your crank case. Attach the coupler to your intake, and start filling it up. Take small intervals to listen for any air escaping. You will want to ensure that the pressure your system holds is above or equal to your boost target. If you hear air coming from the seal for your VVT solenoid on your valve cover, this is normal. Once you start hearing excess air escaping, or your gauge on the air chuck is not showing that it’s holding steady pressure, then you know you have a leak. The best way to visibly spot the leak is by spraying the suspect area with soapy water. It will reveal the leak as shown. In this case, it was an FMIC coupler. However, these leaks can originate from a bad vacuum line, stuck open BOV, bad gasket. This method will expose any of these things. What If It’s Not This? If you have tested your system and found no source of a leak, then the next obvious things would be to inspect your MAF sensor, O2 Sensor, EVAP Solenoid, and exhaust system. MAF – Sometimes these sensors fail, or get dirty. Cleaning them can sometimes render results but not always. Take it out and inspect it for grim or build up on the wire. MAF cleaner can be purchased at your local parts store. O2 Sensor – Sometimes O2’s can get sleepy or go bad. Typically, when they do go bad, the readings are a bit more all over the place, or extreme. But it does happen sometimes. The one responsible for AFR is an expensive Wideband sensor, so unless you’ve tried everything else, don’t throw money at a new one unless you’ve eliminated other variables. EVAP Solenoid – This is responsible for allowing gas fumes from your EVAP system to be purged into your induction system to be burned off. However, the solenoid can sometimes be stuck open, and allow unmetered air in at the wrong times. Check to see if air passes through, or swap on a friend’s and see if it fixes the problem! Exhaust – Cracks in the manifold, or downpipe before the 02 can trip up the sensor, thinking there is more air in the mixture than there is. The stream of the exhaust can pull in air from outside and confuse it. Look closely and listen for an exhaust leak. It’s typically easy to distinguish the sound. Check out our latest CorkSport youtube video to catch a little more detail on this subject! If all else fails, our staff at CorkSport is here to assist you over the phone the best we can for any of your Mazda or Mazdaspeed needs. Give us a call anytime for quality technical support at 360 260 2675.